We have seen an increase lately of firms claiming to offer amazing retentions, using something called Limited “Extra” or other such terms. A lot of these firms have 1 page websites with no more information on the firm than a telephone number. They don’t even give you an address or the details of who they are! Well, what these websites don’t tell you is that these are Tax Avoidance Schemes that use EBT’s (Employee Benefit Trusts) or derivatives of EBT’s that they clam are different, just because they call them by another name. Well they’re not different and they don’t work, but these firms don’t care because they have absolutely no intention of being around when HMRC come calling, often many years after the event. These firms will claim to have a “Legal Opinion” from Senior Tax Counsel stating that the scheme is legal but they won’t let you have a copy of it, so you’ll have no idea what Counsel was giving an opinion on, or more importantly, WHEN Counsel provided the opinion, it could be years old and no longer valid! We have clients who signed up to similar schemes many years ago and were under the impression that they’d successfully avoided a load of tax. BUT then HMRC came calling, in some cases, 7 or 8 years later and issued APN’s, (Accelerated Payment Notices). These allow HMRC to demand payment and you have no right of appeal, so pay up within 90 days or expect the bailiffs to arrive. Since their introduction in 2014, HMRC have issued 60,000 notices and the average amount demanded is £50,000! 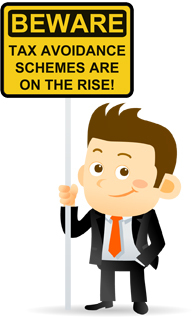 The reality is, if these schemes worked, all accountants would be offering them! The fees offered by these providers are enormous. No firm would sit by and let these outfits claim a competitive advantage unless they knew that these schemes were bogus and they were too ethical to sell and run…….. so as your granny probably told you, “Caveat Emptor” (Buyer Beware).